The tide is rapidly turning towards widespread city acceptance of the need for a shift to a low carbon economy. This was just one of many important headline messages coming from an unprecedented group of leading city figures who met last week at the magnificent Guildhall, in the heart of the City of London, to discuss climate change, the 'carbon bubble' and the transition to a low carbon economy. Another headline of the event was that world leaders have now made it clear that they will defend the line of a 'two degree planet' in the upcoming COP21 climate negotiations in Paris, and that investors must heed these political and market messages and shift to a low carbon roadmap or risk their shirts. In a specially recorded video address HRH The Prince of Wales told the Guildhall audience that "The finance community needs to consider whether to divest from sectors involved in fossil fuels, and whether to invest in sectors which support the low carbon economy and are therefore better position in terms of risks and opportunities." The event was attended by CEOs, Chairs and senior executives from many leading city firms as well as 300 leaders from the worlds of finance, business, government, policy, civil society, faith, philanthropy, higher education and health. A major theme running throughout the event was that of stranded carbon assets, a concept that many leading figures have come out in support of. For example Mark Carney, Governor of the Bank of England has said that the "vast majority of reserves are unburnable" if global temperature rises are to be limited to below 2C and that this represents "potentially huge losses" to asset managers. Because of this the Bank of England and the G20 are both now examining the risk this issue poses to the global economy. Sarah Butler-Sloss, representing Europeans for Divest:Invest, and one of the organisers of the event, spoke of the rapid flow of global investments divesting from fossil fuels and into the low carbon economy, amounting to over $2.6tn. She told the audience that "There are overwhelmingly strong financial as well as moral and ethical reasons for doing this" and went on to say that Blackrock, the world's largest money manager, is exploring a fossil fuel free fund development for launch in early 2016. In a rallying call for action from the city Butler-Sloss said that "We urgently need you the finance sector to provide good investment opportunities aligned with a two degree world. I call on you - our colleagues in the asset management world - to take a leadership position and to become future makers not future takers in the way we respond to the dire threats of climate change". Christiana Figueres, Executive Secretary of the United Nations Framework Convention on Climate Change delivered a rousing speech in which she thanked HRH The Prince of Wales and Mark Carney for their leadership on carbon risk issues and referred to a pre event CEO breakfast that morning at the Guildhall which Carney had attended. Figueres emphasised the unstoppable pace of climate negotiations and how that is influencing the way markets approach carbon risk. Highlighting a number of market signals, including the $2.6tn of assets already divested from fossil fuels, she talked of a super tanker which had now firmly changed its course and "a major transition already in place". According to Figueres there is no doubt that the world will transition away from fossil fuels, it is only question is pace of shift. 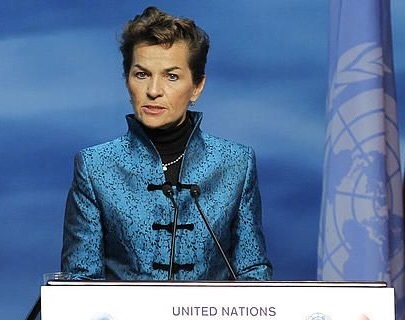 In a phase that was echoed by other speakers Figueres said that "we are not in a world of business as usual, we're in a world of business as urgent" and argued that, while a climate change deal to be agreed in Paris in December will not come up with a global carbon price, this was not relevant because "We already have a strong carbon price signal" in many jurisdictions around the world, with almost 80% of global emissions under some sort of carbon pricing now. Figeures made it clear that the Paris deal will sketch out a roadmap to a net-zero emission economy in which most reserves booked by fossil fuel companies will not be able to be burnt and will therefore become stranded assets. But she warned that, despite this, the energy industry is still banking on ever-rising demand for its products as if nothing has changed. For Figueres, "these [projections] are pure fiction". Mark Campanale from one of the event organisers, Carbon Tracker, echoed this saying that fossil fuel company growth plans are "irreconcilable with the carbon budget which is doubtless going to be agreed in Paris". From other panel discussions it became clear that many investors are increasingly concerned that fossil fuel groups and their insurers are on the wrong side of a powerful historical shift and could be swamped with exorbitant class-action lawsuits along the lines of tobacco and asbestos litigation in the US. Abyd Karmali, Bank of America's head of climate finance commented that talk of such litigation risks "is setting off alarm bells that there could be long tail risks" for those not incorporating such issues into their analysis and that "Paris gives us all a non-exchangeable, one-way ticket to a low-carbon economy." Karmali said that because of this, and the increased risks associated with carbon heavy assets, his bank has now accelerated its shift out of coal stocks to "a very low level" and that Bank of America now have three times the exposure to renewables as they do to coal. Underlining how significant this shift is, he described this as "remarkable for a conservative institution like ourselves". Mark Lewis of Barclays shook the audience with a cautionary tale that ten years ago, the utility sector ignored the signs of the coming tsunami of renewables and that those utilities lost 60-80% of their value. He also pointed out that sell side analysts completely misread the way the market would shift on renewables. He warned that translating what comes out of the Paris talks for financial analysts will not be straight forward and it will need their clients to be calling for more incorporation of carbon risk in asset mangers investments for this issue to become of focus for most mainstream financial analysis. Echoing what Figueres had said, Lewis underlined that a huge market shift away from high carbon assets is underway, whether or not analysts are always recognising this, and quoted the CEO of energy company ENEL that "there is a huge tide flowing, you can decide in which direction to swim but the flow is not in your control and nor is the direction it is flowing." However, despite some city institutions being more and more engaged with these issues, Helena Morrissey, CEO of Newton and chairman of Investment Management Association, warned that the impact of climate policy is still not high enough on agenda of most investment companies and that there is a need for an end to silos and a shift to integrated investing in which climate change becomes fully part of the mainstream way of doing thing for city institutions. Morrissey warned her peers that "We slept walked into the financial crisis and we have no excuse for sleepwalking into a climate crisis" and called for more sense of urgency from the investment community who should stop delaying tough decisions for lack of a clear enough roadmap from politicians. She also called for more pressure from clients and others to encourage bodies like the Investment Association to take carbon risk more seriously. Anthony Hobley of Carbon Tracker echoed this idea of sleepwalking into crisis saying that the old energy order is living on borrowed time and compared what is happening today with the inevitable shift away from carbon to the decline of Britain's canals in the mid-19th century when railways burst onto the scene and drove down cargo tolls, destroying the business model. Giving Kodak and blockbuster as more recent examples, Hobley pointed out that technology takes no prisoners and to a long graveyard of industries and companies that stuck doggedly to business as usual at key inflexion points and said that "Incumbents invariably fail to see it coming." Hobley underlined what other speakers had said in terms of the message expected to come from the December Paris climate summit saying that "Most international laws or treaties are not about breaking new ground. They are about codifying what the major powers are doing anyway. The success of Paris will be in codifying what is already happening. For incumbents and for you as investors it will open a window for you to see the transition that is already taking place. It will give the incumbents an opportunity to get on the train before it departs the station." Lord Adair Turner, former Director General of the Confederation of British Industry, chair of the Financial Services Authority and the UK Climate Change Committee, echoed much of what was said by others when he closed the event and said that "Businesses should embrace a low carbon economy, particularly in the wake of the VW scandal rather than finding fancy, non honest ways of denying what is coming towards them." Turner also warned that asset managers who are not talking about how to keep the two-thirds of high carbon stranded assets in the ground should not be taken seriously on climate change. Turner said that the transition to a low carbon economy will be "scrappy, organic and non-linear" and require all of us to accept responsibility and not abdicate it to politicians and in closing the event called for business, asset owners, and asset managers to "co-create the energy transition" we need in order to combat climate change. The conclusion for those of us attending the conference was that we can now be optimistic about the shift to a low carbon economy, but only if we all take responsibility. Here is what you can do as an individual: pledge to Divest:Invest and sign up to Share Action's Green Light Campaign to start lobbying your pension fund to engage with these issues. You can view the video recording of the speeches and panel discussions here. Jules Peck, a Founding Partner at Jericho Chambers, is Strategy Adviser to Europeans for Divest:Invest.